Measuring, mapping and monitoring the incidence of salinity across Victoria is an extensive and on-going task. There is a range of assessment and mapping methods which require clear standardisation and documentation. Sites of salt-affected soil caused by groundwater discharge have been mapped for dryland areas in Victoria using a method based on the identification of salt tolerant species. 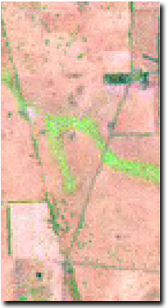 This report "Method for field assessment of dryland salinity in Victoria using GPS technology"; completed in November 2008 by Robert Clark from the former Department of Primary Industries, describes in detail the current field method employed to identify, assess and map the extents of dryland salinity in Victoria. The Victorian soil salinity monitoring project, funded by the former Department of Sustainability and Environment provides support for standardised collection of data showing the extent and severity of soil salinity. This project also manages the storage of the data in the Corporate Data Stores and distributes information products back to the community. The current soil salinity layer collates all available recorded soil salinity mapping in Victoria. This report from 2007 summarises a review and analysis of the data asset to identify and understand attribute errors within the data. This will allow for its management, condition and use to be improved. Field based methods are an expensive and labour intensive way to measure salinity at a state wide level. Airborne and satellite based multi-spectral sensors have been advocated as technologies for reducing the cost of field based measurement of soil salinity. However, they are limited spectrally and spatially (Landsat 7 for example has 6 bands in the visible to mid-infrared region ranging from 60 to 250 nm wide with 30 metre pixels), and it is unlikely that such data will ever successfully map vegetation down to a genera or species level. Instead, methodologies using multi-spectral data tend to rely on surrogate indicators of soil salinity such as mapping areas of consistently poor growth. This approach works well in some environments, but is likely to be limited in moderately and slightly saline areas where salt tolerant species can still thrive and maintain good ground cover. In contrast, hyperspectral sensors with over 100 spectral bands have a much greater ability to differentiate vegetation down to genera and in some cases species level. The Australian designed HymapTM (external link) sensor has 126 bands in the region between 450 nm to 2500 nm width band width varying between 15 and 20 nm and 3 metre pixels. These sensors have the potential to significantly reduce the cost of mapping and monitoring the extent and severity of soil salinity based on the presence of salt tolerant species while maintaining the accuracy of the current field based method. A report has been produced documenting the accuracy attained by each combination of classification algorithm, reference spectra and different spatial resolutions for the hyperspectral image data. It discusses the strengths and weaknesses of the various classification algorithms and methods for generating reference spectra and goes on to document a preferred methodology for mapping the extent of soil salinity using hyperspectral data. It also comments on current limitations of hyperspectral data and associated analytical techniques, the appropriate spatial resolution for mapping soil salinity and other potential applications for this technology. This draft report provides groundwater monitoring data for a selection of key observation bores from the Victorian dryland salinity observation bore network. It has been produced as part of the requirements of the Statewide Dryland Salinity Monitoring and Regional support projects carried out by, the former Department of Primary Industries on behalf of the former Department of Sustainability and Environment. It should be noted that this reporting is a “snap shot” of groundwater behaviour over the monitoring period and is in no way comprehensive assessment of the entire bore network. Monitoring is being conducted to collect data on the extent and severity of dryland salinity across Victoria. The monitoring will enable trends in salinity to be detected, and at paired sites, will indicate whether or not treatment is having an effect. 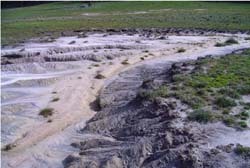 Salinity is documented using a variety of techniques, and this report details the standard method and procedure adopted in Victoria. The standard enables anyone to conduct monitoring and produce results directly comparable to their peers, both now and in the future. The assessment of the extent of the discharge at the site is conducted using electromagnetic induction, vegetation analysis and soil sampling. The method has been used in Victoria for 10 years and has proven to be reliable. The report focuses on the discharge monitoring site network. It details the methods used to select and establish a monitoring site, and the re-assessment protocol. It is proposed that these procedures are to be used as the standards for the dryland salinity monitoring network in Victoria. This draft report provides groundwater monitoring data for a selection of key observation bores from the Victorian dryland salinity observation bore network. It has been produced as part of the requirements of the Statewide Dryland Salinity Monitoring and Regional support projects carried out by the former Department of Primary Industries on behalf of the former Department of Sustainability and Environment. It should be noted that this reporting is a “snap shot” of groundwater behaviour over the monitoring period and is in no way comprehensive assessment of the entire bore network.